Mann was arguing with ACP Satish Malhotra when supporters standing at the main gate of DMCH raised slogans of Khalistan in the presence of heavy police force. Slogans in favour of Khalistan were raised on Friday when SAD (Amritsar) president Simranjeet Singh Mann came to meet Surat Singh Khalsa who is admitted to Dayanand Medical College and Hospital (DMCH). While Mann was arguing with ACP Satish Malhotra, supporters standing at the main gate of DMCH raised slogans of Khalistan in the presence of heavy police force. After a confrontation with the police authorities that lasted about 15-20 minutes, Mann was allowed to meet Khalsa along with ADCP Paramjeet Singh Pannu. “Sikh prisoners should be released. It is up to CM Parkash Singh Badal to see how he can resolve this issue,” Mann said later. ACP Malhotra, when contacted, said pro-Khalistan slogans were raised by few persons “but it did not happen in my presence”. Earlier, PPCC spokesperson Sukhpal Singh Khaira came to meet Khalsa but was turned away. 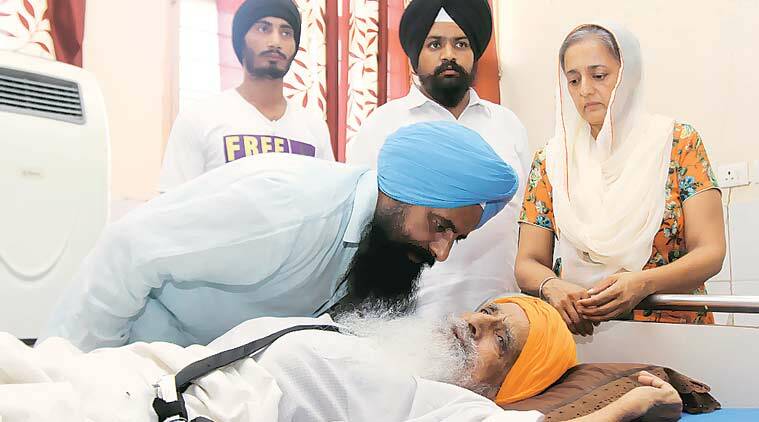 Ever since Khalsa has been sitting on hunger strike, a Congress leader came for the first time in his support. “So what if SC restrictions are there regarding the release of Sikh prisoners. CM or Deputy CM should at least meet Khalsa once on humanitarian grounds. It shows lack of concern,” Khaira added. Though hospital functioning was hit due to frequent visits of leaders, Khalsa was stated to be stable. He spoke in a feeble voice with Mann and his daughter. Khalsa wants to meet CM Parkash Singh Badal over the issue. Sources said earlier in the morning, Education Minister and advisor to CM Daljeet Cheema had visited the hospital to meet Khalsa. But the visit was kept secret.